The symmetry in this little feature really is amazing to me. I'll go out on the limb and guess that it is the mold of a small crinoid holdfast. How unusual! I don't think it is a holdfast, as 1) it is very symmetrical and crinoid holdfasts are not, and 2) it does not seem to have a central attachment point for a stem. However, what it is I don't know. Very intriguing! 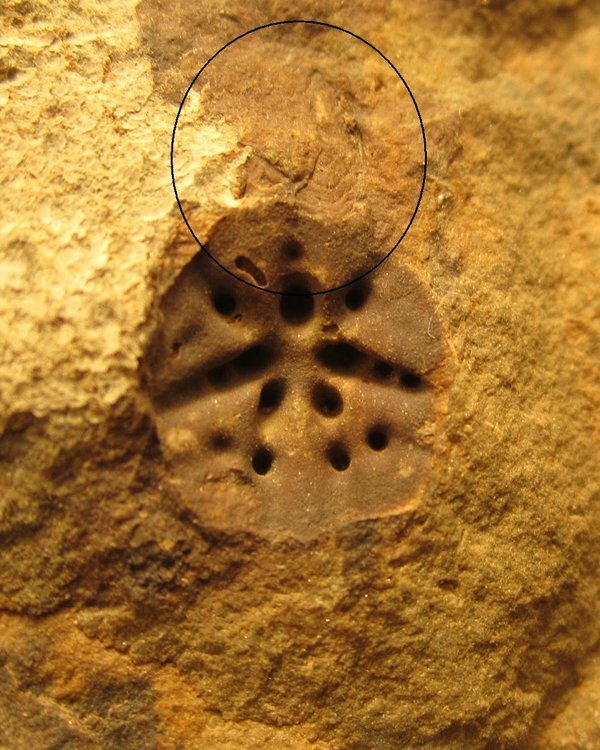 The hold fasts of crinoids that I an familiar with look like segmented tree roots. If it is a holdfast I do not believe it is crinoid. But I have no idea what it could be. Camera battery went dead. Soon as it charges up I'll get better lighting and provide better pics showing the depths of the holes better. My best guess is a placoderm (armored fish) scale. See: https://www.researchgate.net/figure/241075604_fig3_Fig-3-Placoderm-material-from-the-Lochkovian-of-Spain-A-I-Kujdanowiaspis-podolica "First Perigondwanan record of actinolepids (Vertebrata: Placodermi: Arthrodira)from the Lochkovian (Early Devonian) of Spain and itspalaeobiogeographic signiﬁcance" by Vincent Dupret et al. 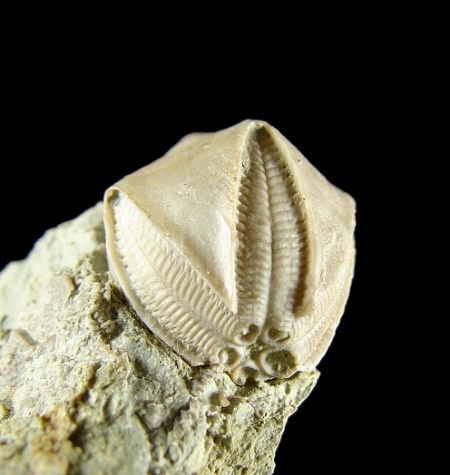 Note similar bumpy plate with bilateral symetry: figure K.
Something about it feels crinoid, I don't know what. If it is placoderm, you have found the holy grail! These things are rare in any formation, and I haven't heard of any in the mahantango. I do not think the fish plate would fit. The cystoid plate is a similar pattern of bumps and ridges ... but not quite the same. 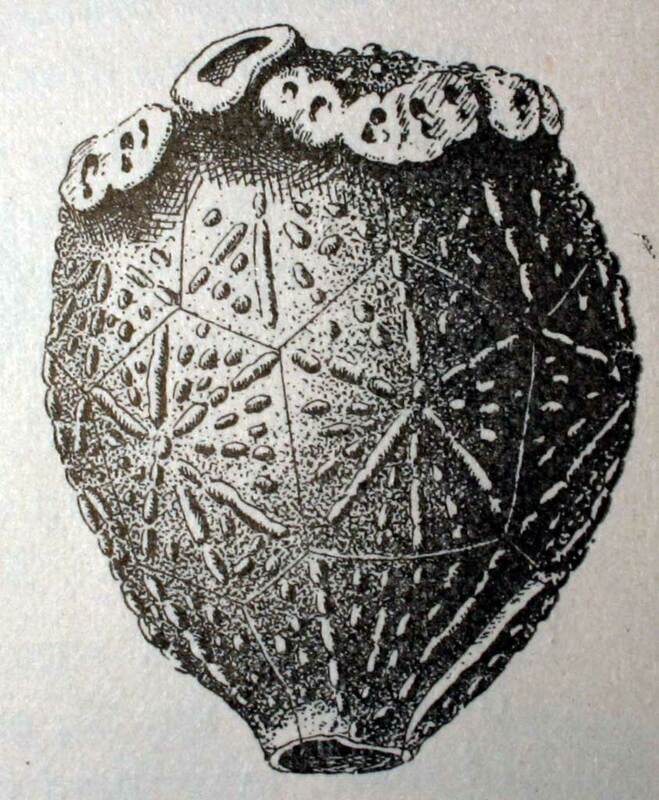 The cast of this would have ridges with spikes on them plus some individual spikes. Tried several photos with the flash and other variations, this is the best I can get. Keep in mind, it is only about 8mm across. I'd agree with cystoid, there are different species with different features. This is also an irregular pattern, although symmetrical where the cyctoids are a more regular pattern. I searched many, many illustrations and pictures and found none that resemble this. Have you any pictorial examples ? I'd really like to see something similar. Thats a strange one! The outside seems to have a crude five fold symmetry suggesting an echinoderm of some sort. Maybe a crinoid or cystoid calyx? Nothing really definitive on this one yet, will keep this item open and un-tagged for now. Have yet to see any other references that are convincingly similar. This is my guess as to why it is not as straight as would be expected from a cystoid, cystoid plates are curved upward (kinda like a contact lense) and when you split the shale, the top layer came off with it. You can still see the vague outline of the pentagon. I think caryocrinites is found in the mahantango by the way. Another possibility is a cystoid plate. I'll go with this as well. I can find nothing else that comes this close. I think it could be a blastoid calyx imprint in the matrix, the circled portion being the imprint of one ambulacral zone. Very interesting possibility, thanks for posting ! I tried to prep that little piece off in the center of your circle to maybe see more of the feature but it is part of the matrix. Try as I may, I cannot get a good pic that shows the depth and shape of the holes. They are tapered and have a radiussed point at the end. I'm considering making a cast but would then have to destroy the mold to extract it. If there was a way to seal the surface, then use a mold release agent before filling it with latex, or silicone I might be able to salvage the mold. Any suggestions ? Or use some glass reinforced epoxy (or polyester) and destroy the mold as the holes are splayed a bit and would not allow a rigid cast to be extracted. Suggestions ?